Over the years many products have been developed to protect pipes. Although the conventional ion exchange water softener, now in use for over 100 years, is the product of choice, there are many alternatives. The use of phosphates to inhibit scale buildup goes back to the early 19th century. Phosphate treatment does not remove hardness minerals but “sequesters” them to prevent hardness scale deposits. Preventing scale with phosphates has wide application. Poly-phosphate cartridges (which often combine phosphate with carbon to add taste/odor improvement to scale prevention) are very popular in restaurants, for example, to protect equipment such as coffee machines from scale while providing good-tasting water. Poly-phosphate can also be fed as a liquid into a water stream to protect home appliances and to prevent hardness buildup on buildings and sidewalks from irrigation water. Siliphos beads, popular in Europe but not as widely used in the US, are an application of phosphate technology. Siliphos is a natural product, made of milk thistle, that forms a microscopic coating on the inside of pipes to protect from scale formation. Above is a granular activated carbon/ phosphate cartridge for scale prevention and chlorine/chemical reduction. 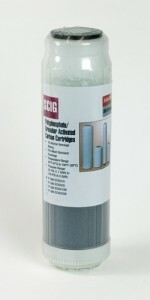 It fits standard filter housings and contains Granular Activated Carbon with 8 ounces of polyphosphate. This is a good taste/0dor cartridge that protects equipment (coffee machines, icemakers, etc.) from scale formation. Phosphate does not remove hardness minerals in water but “sequesters” them so that they do not damage metal surfaces. The cartridge is good for about 2000 gallons service at a one gallon-per-minute flow rate. There are highly concentrated chemicals that can be pump fed into the water stream to protect large reverse osmosis membranes from calcium scaling. Spectraguard, for example, is used to protect reverse osmosis membranes from calcium scaling even when inlet water is extremely hard. It can replace a water softener for RO pre-treatment. The popular treatment medium KDF, most often used for chlorine reduction, as in shower filters, for example, is also marketed as a scale preventer. KDF uses the “redox” process of passing water over dissimilar metals to modify the structure of scale causing minerals and converting hardness to Aragonite. There are variations on this technique that use metal bars inside pipes rather than granular KDF media. Magnets, Electro-Magnets and the Newer Methods, TAC and NAC. Over the past few decades consumer demand for non-traditional scale prevention methods has led to the development of a number of magnetic and electro-magnetic devices. Treating scale with natural magnets actually goes back to the late 19th century. Currently there are a great number of electro-magnetic and other electronic systems on the market, ranging from simple and inexpensive to very complex and very expensive. The effectiveness of electro-magnetic devices is often debated. By far the most popular new “salt-free” technologies, however, is TAC (“Template Assisted Crystallization”), which has become very big in the residential market and is also used in commercial applications. TAC works both in tank style units, which require no backwash, no electricity, no salt, no drain connection, and cartridge-style units for smaller applications. Like other alternative methods, TAC does not actually soften water by removing hardness minerals, but instead purports to convert hardness to microscopic crystals. As with other non-traditional softening methods, TAC units do not actually remove anything from the water, so their performance is essentially impossible to quantify with a test. These units cost a bit more than conventional softeners, but do not consume water, salt or electricity. The media, however, is expensive and requires replacement, usually after 3 to 5 years. TAC units are also more fragile than softeners, requiring protection from sediment, chlorine, copper, and iron. We do not sell magnets or electronic conditioners, but we do offer small poly-phosphate cartridges and feed systems (pumps, tanks, media) for larger applications. 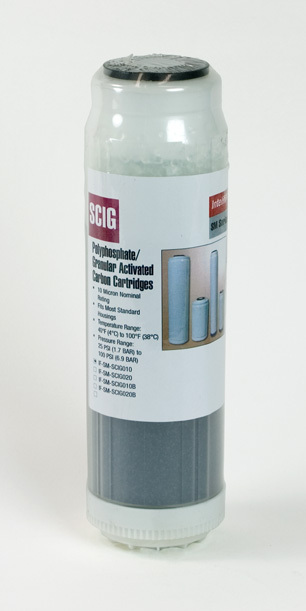 We have Siliphos in bulk and can put it in cartridges for whole house scale prevention. We have Spectraguard for large RO protection. We have KDF in bulk, in cartridges, and in shower filters. We have all sizes of TAC (OneFlow, formerly branded as ScaleNet). With these we stock media, cartridges, and pre-built units. We have a very good sequestering product called Unrust for iron and hardness in irrigation wells. And, yes, we do have lots of water softeners, both single tank and twins, in different formats and sizes. They cost about 1/4 as much as the telemarketers’ systems, but you don’t get a free year’s supply of soap.